—Barack Obama, speaking to guests about donating to outside spending groups at a fundraiser hosted by Beyonce and Jay-Z. As the Huffington Post reported, the remark was “seemingly in jest” but also the latest example of how closely campaigns have flirted with the ban on coordinating their activities with outside groups. That rule is hardly ever enforced, though, and as Campaign Legal Center senior counsel Paul S. Ryan told HuffPo, Obama’s comment was vague enough to not qualify as a direct request for contributions. More than 70: The number of dark-money 501(c)(4) groups, ostensibly operating as tax-exempt “social welfare” organizations, that the Internal Revenue Service is investigating. The groups can’t legally make political activities the majority of what they do, although many make little effort to conceal their political spending, and the IRS has had its eye on groups like Karl Rove’s Crossroads GPS for several months now. Even so, the agency hasn’t stripped a single group of its 501(c)(4) status in the past six months. • Romney Funder’s Israeli Newspaper Buries Video Controversy: Sheldon Adelson spends millions on ads for Mitt, but tries to downplay the GOP candidate’s gaffes. 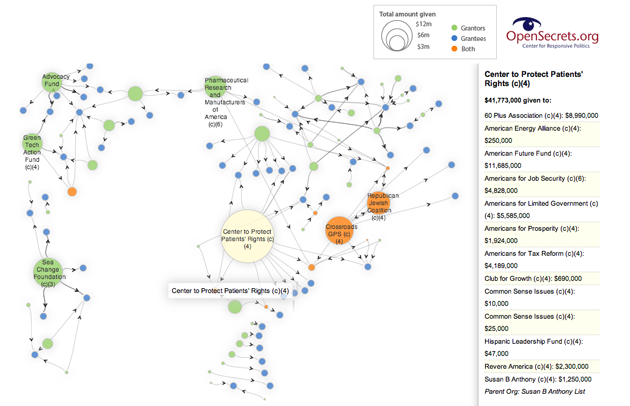 • Crossroads, US Chamber, and Other Dark Money Groups Notch Big Court Win: A federal appeals court has overturned an earlier ruling demanding that nonprofits unmask their donors for certain ads. • Liberal Super-PAC Targets Koch Brothers With Attack Ads in Wisconsin and Iowa: Patriot Majority takes the fight to the Kochs in the state that, for liberals, made them infamous. • Who Was at Romney’s “47 Percent” Fundraiser? : Some possible guests at the $50,000-a-plate Florida event where the candidate cast Obama voters as moochers. • SECRET VIDEO: Romney Tells Millionaire Donors What He REALLY Thinks of Obama Voters: When he doesn’t know a camera’s rolling, the GOP candidate shows his disdain for half of America. 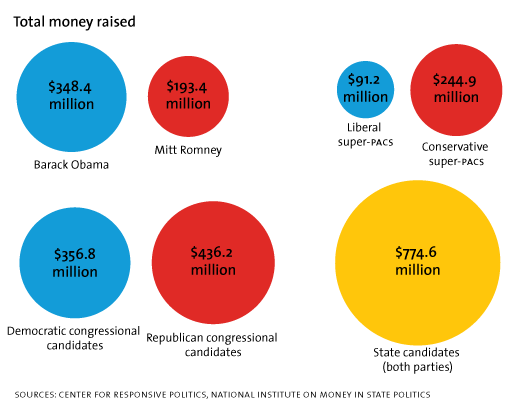 • More charts from the Daily Beast and Center for Responsive Politics.